Matilda will always have a special place in my heart. It was one of my first favorite movies and taught me a lot of things about life, myself, and the people around me. The movie will be 19 years old this August (!!! ), and though our world has completely changed, its lessons still hold up today. Matilda is a strong, feminine, female protagonist. Many times in movies, the strong female characters are described as “one of the boys,” or they only know their amazing skills because “they had brothers.” Tomboys rock, obviously, but it’s nice to have both ends of the spectrum represented. Matilda wears floral dresses and always has a ribbon in her hair. She isn’t painted as the “anti-female,” she’s just Matilda. 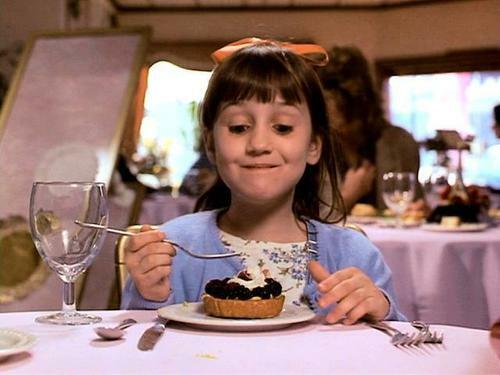 Matilda cuts toxic people out of her life — even her parents. It doesn’t matter what someone’s relationship is to you; if they abuse you, they don’t deserve you in their lives. Matilda realizes at a very young age that her parents aren’t good people and she detaches from them. The moment that she finds a new guardian (do I have to include a spoiler alert if the movie is as old as I am? ), she ditches her parents and finds someone who truly appreciates her for who she is. Matilda’s father is a dirty cheat who runs a very illegal (and immoral) car dealership. He is painted as the villain, and the FBI is hot on his tail. In the end, the rest of the family has to relocate to Guam to escape the Feds. The Trunchbull is an evil woman who cheats her niece out of her own home. In the end, the Matilda and all the children in the school punish her for her cruelty and sets everything right. Cheaters never prosper. Matilda is an avid reader and she spends practically every waking hour with her nose in a book. When I was four, I wanted to be just like Matilda, so I began reading all the time. I read when I was walking, I read in the bath, I even snuck a book under my desk during my lessons in primary school! The good characters (Miss Honey and Matilda) read and the antagonists don’t, which makes reading seem like something all good people should do. Matilda shows children the importance of independence. Now, I’m not suggesting that we should leave our toddlers to fend for themselves all day, but I think it’s important for kids to know how to entertain themselves so their parents can get a momentary break from the chaos and infinite energy children have. No child should be ignored. Our hearts bleed for Matilda. Her parents toss her in the back seat of their car and mention how her birth was a “waste of time,” they leave her alone all day, and her mother plugs her ears when her child tries to talk to her about her school day. Matilda’s mother gets her comeuppance in the end for her treatment of her daughter. This movie shows people that no one, especially children, deserve to feel unwanted. You’re never too old (or too young) to stand up for yourself. Matilda stands up for herself against her toxic parents at a very young age, which is impressive and brave, especially considering that many people tell children to keep their heads down and respect their parents. With Matilda’s assistance, Miss Honey finds the courage in herself to stand up to her evil aunt and reclaim her home. Even though Matilda’s parents and the Trunchbull are way bigger and stronger than Matilda and Miss Honey, the protagonists find strength and stand up for themselves, which helped them rid evil from their lives. The kids support each other. Kids can be cruel; that’s a fact. But the kids at Matilda’s school all stood up and supported each other every time Trunchbull’s tyranny rained down. Nothing helps you feel better when you’re feeling scared or abused than knowing that you’re not alone. It can be scary to stand up to your enemies (especially when they’re related to you) but knowing you’re not alone is the best way to get that courage. Matilda’s parents are sloppy, ignorant, and cruel, whereas Matilda is kind, brilliant, and courageous. Many people worry that growing up in an abusive home will make them abusive to their own family later in their own life. This does not have to be the case. We are not our parents; we are not where we come from. We are the things we do with our lives and the way we treat the people around us. One of the most pivotal scenes in the film is when Ms. Honey comes to Matilda’s home to discuss the child’s brilliance with her parents. Matilda’s parents literally laugh in her face and tell Miss Honey that education is stupid, just like children. Miss Honey is horrified and explains how education is needed in our everyday lives and how educated people help society function. Stay in school, kids. When Matilda decides that all bad people deserve to be punished, the pranks she pulls on her parents to get revenge are award-worthy. From bleaching her father’s hair to super-gluing his hat to his head, Matilda’s prank game is on fire. Her powers are the bees knees. Who doesn’t want amazing telekinetic powers? In the book that the movie is based on, it’s explained that her powers are due to the fact that her brain is bored in the lower grades since the work isn’t challenging enough for her. She eventually loses the powers as she reaches higher levels of academia, but it was amazing while it lasted. Matilda gets adopted by Miss Honey, Miss Honey gets her childhood home back, and neither of them are tormented by their abusive families anymore. They spend the rest of their days eating chocolate and inline skating in the living room. This ending always makes me tear up because it shows you that it gets better. You may feel like you aren’t worth happiness and that you’re drowning, but eventually you’ll get your happy ever after because you deserve it.